Raw Oil-Free Cashew Mayonnaise is nothing short of a plant-based vegan dream come true! To begin with, it’s a far healthier alternative to store-bought vegan mayo. And with only five ingredients and a blender, you get mayonnaise with healthy fats, an extra creamy texture that tastes out of this world delicious! Lastly, it’s raw. Raw means that nothing in this mayo is heated or cooked. All of the lovely ingredients in this recipe arrive with their nutrients intact. Neato! There are quite a few brands of ready-made dairy-free mayo available for purchase. 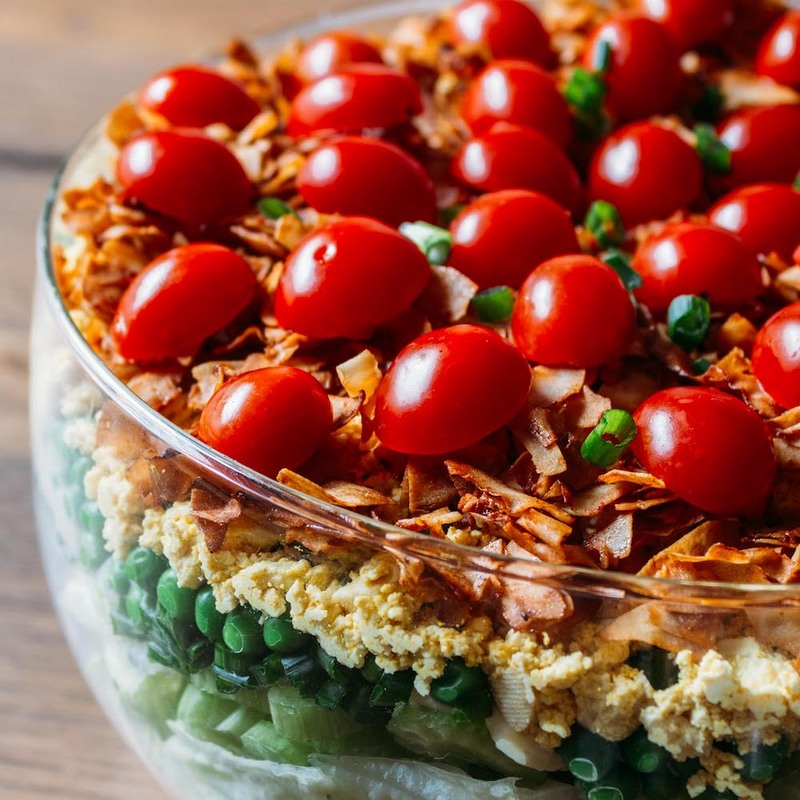 If you haven’t noticed, plant-based eating is getting downright trendy! The only drawback to store-bought varieties is that store-bought mayo contains a lot of oil. I’ve been trying to wrap my brain around consuming a bit less oil these days. So I figured it was time for me to come up with a delicious dairy-free mayo that’s also oil-free. And here we are. Now, let me clarify that when I say oil-free, I do not mean to suggest that it is fat-free. That being said, I hope that you know that fat is not all bad. Certain fats are even good, and the fat from cashews happens to be mostly monounsaturated and polyunsaturated. When substituted for saturated fats and eaten in moderation, mono and polyunsaturated fats can help improve heart disease. They also reduce the risk of stroke and prevent weight gain. Polyunsaturated and monounsaturated fats also provide vitamin E.
Vitamin E is a powerful antioxidant that is great for promoting positive cell growth and overall health. To give you an idea of how incredibly tasty this mayo is, I suggest you try a bite straight from the blender after you’ve made it. I know. I know. Perhaps that doesn’t sound appetizing to you if all you have ever tasted is factory packaged mayo but trust me and taste. Don’t spread it on anything or mix it with a salad… just dip in, taste, and see how good it is! 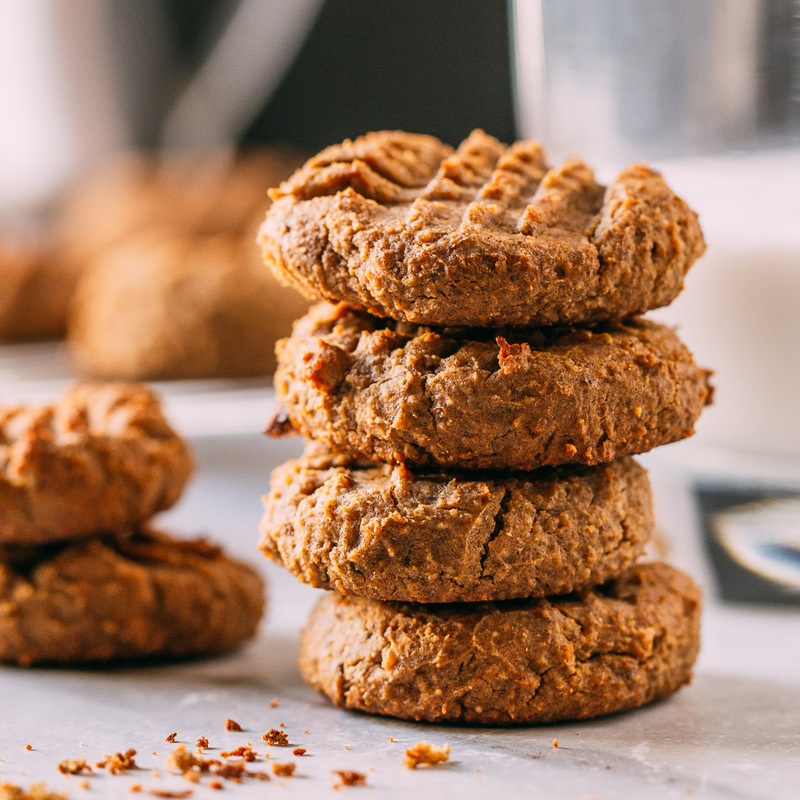 When I made trial batches to test this recipe I started getting excited right away. In fact, I would run from the kitchen to find family in other parts of the house to share a taste… cracker free, just the spoon. 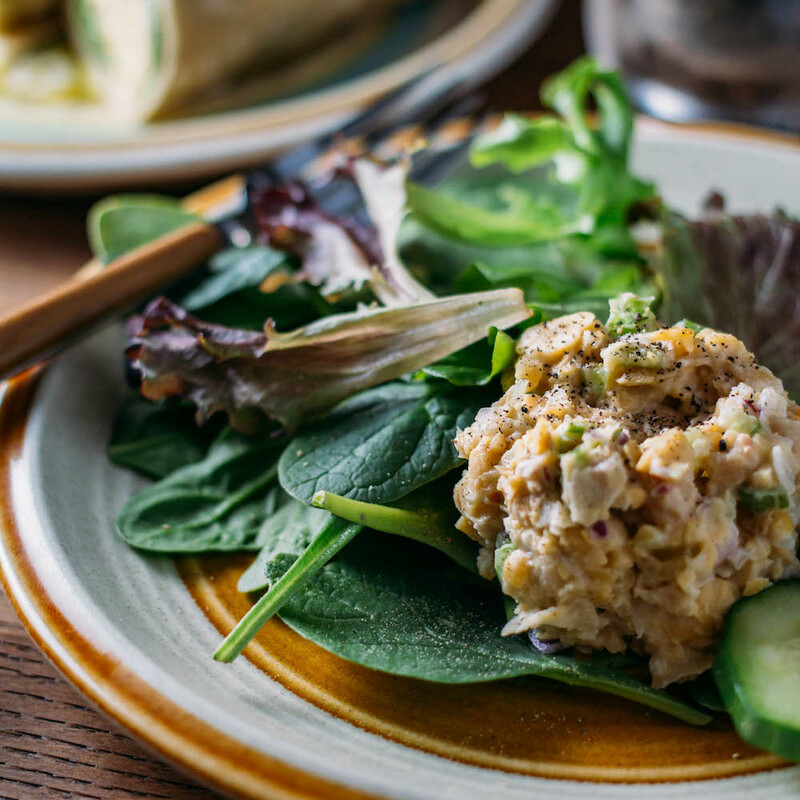 We fell head over heels for this Raw Oil-Free Cashew Mayonnaise, and I bet you will, too. With only 30 calories per tablespoon and 2.4 grams of fat, this mayo blows the pants off of the competition! So, pin this recipe for safe keeping and by all means, share it with your friends. 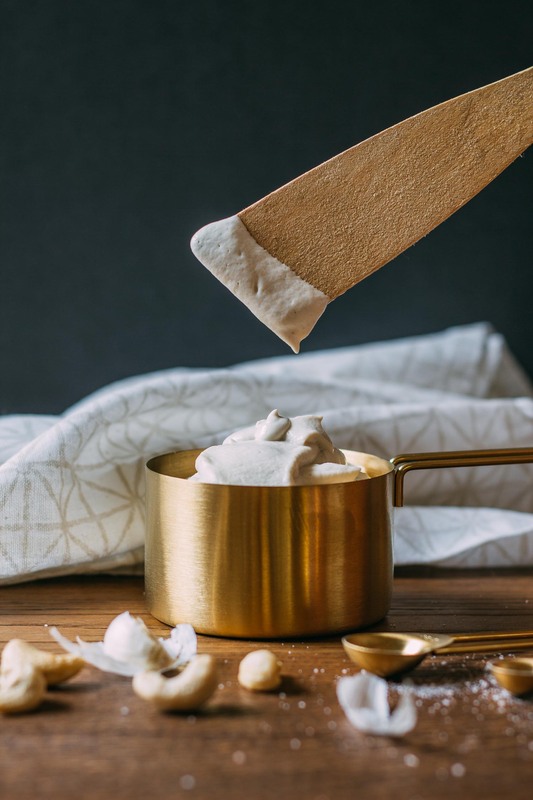 This ultra creamy Raw Oil-Free Cashew Mayonnaise recipe makes about 1 1/2 cups or about 24 tablespoons of delicious plant-based, oil-free, mayonnaise. Use this exactly as you would any mayonnaise. Add it to anything and everything without a shred of guilt! It tastes divine in our no-cook Tofu Curry in a Hurry and our 1-Bowl Super Simple Chickpea Salad, too. And if you’re ever looking for a veggie sandwich recipe that will take you over the edge of deliciousness, try this mayo on our Green Veggie Sandwich with Cucumber, Sprouts & Avocado – it’s a fabulously satisfying and hearty combination of no-cook flavors! Begin by preparing the cashews for blending by soaking. The quick method is to soak your cashews in hot water for at least 20 minutes. If you have plenty of time for this step you can even soak your cashews overnight using room temperature water. Generally speaking, the longer you soak most varieties of nuts, the creamier they blend. In the case of cashews, they are soft, to begin with, so a short soak usually does the trick just fine. 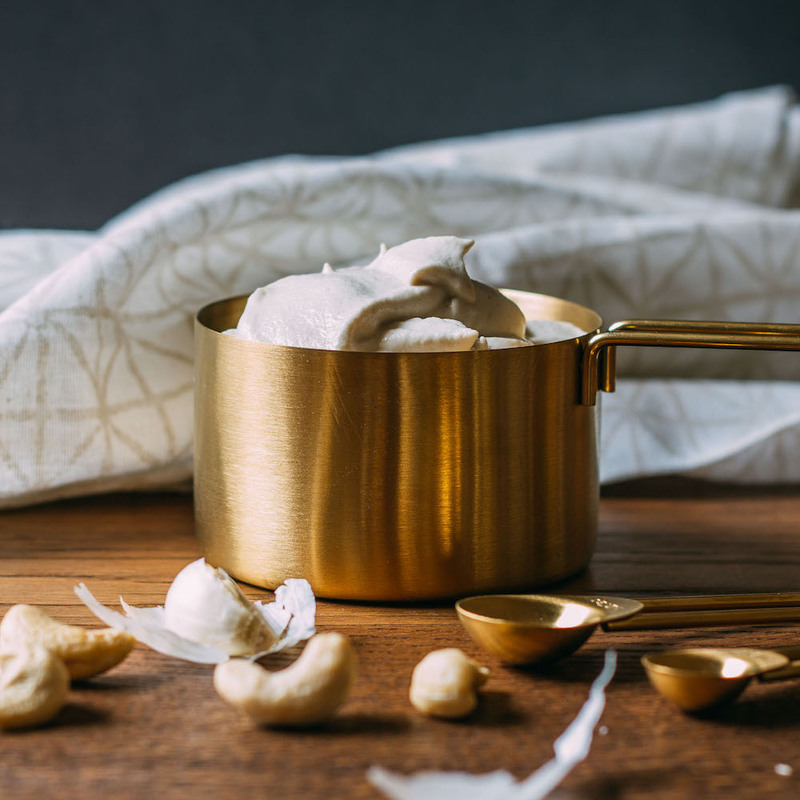 Once the soaking method of choice is complete, drain and rinse the cashews and add them to a blender along with the rest of the ingredients. Blend until smooth and a bit fluffy. Taste the mayo and add more salt, vinegar or lemon juice based on your personal preference. You can serve your Raw Oil-Free Cashew Mayonnaise immediately, or chill it first if you prefer your mayo cold. It will also thicken up a bit more once it has chilled... it's amazing. 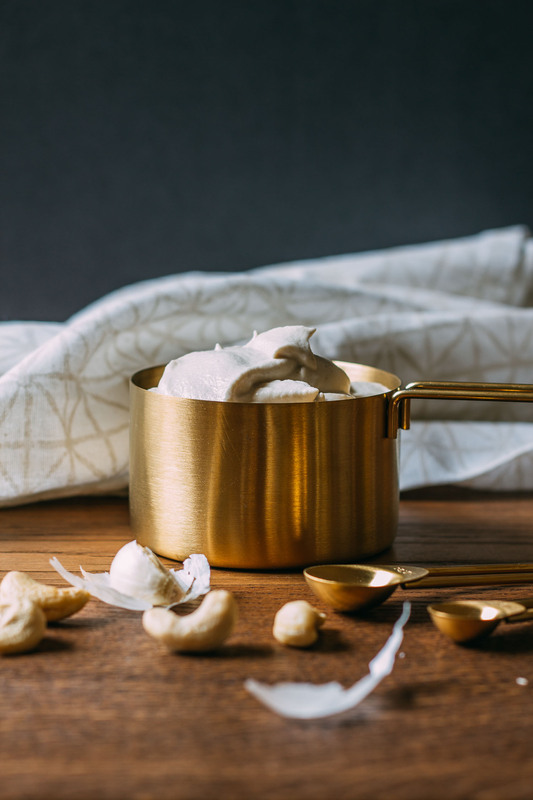 Store your homemade Raw Oil-Free Cashew Mayonnaise in a sealed container in the fridge for up to about a week or even a little longer - it keeps well. But chances are, once you taste this stuff, your homemade jar of mayo will be empty well before a week has passed. Kala Namak, also known as Indian Black Salt is an optional ingredient that gives a natural "eggy" flavor to the vegan mayonnaise. I did not use it in mine, but I thought about it, tried it in a batch and liked it, so it's an option. If you do opt to use black salt, add it to the mayo just before using. Most of the potency of black salt is within the first few minutes of use. Depending on the consistency you’re looking for you can add or reduce the amount of water. When I am stocking up on cashews since they're used so often in my recipes, I usually order this brand because, pound per pound, the value is unbeatable for excellent tasting raw organic cashews. Can this be made with roasted cashews? I know it won’t be raw but I’ve only been able to get roasted unsalted ones. As long as you soak the roasted cashews, as described in the recipe instructions, I believe roasted cashews will work just fine. ThanX you for this wonderful recipe Renee. and YL lemon oil in place of fresh lemon juice. You are right this is good right out of the blender!! Winky, I’ve fallen in love with this recipe and from time to time, a few extra cloves of garlic find their way into the blender. I’ve heard it said that garlic is something you measure with the heart. I made this recipe this evening to go into a chickpea sandwich recipe. I told my husband that I thought I’d just have a snack of mayonnaise this evening! Before I was vegan, I did NOT like mayonnaise, so this is a big change for me. Thanks for the recipe. Thank you for such a glowing review of our Oil-Free Cashew Mayonaisse, Linda. It’s lovely to hear that you could make a snack out of this mayonnaise all on its own. And we’re with you; we haven’t purchased store-bought mayo since creating this refined oil-free recipe. I make one very similar. If desired, you csn always sub part of yhe cashews for cooked small white beans, but id say no more than 50% otherwise you loose the creamy richness of the cashews and it tastes too beany. Thx for the great recipe. I prefer raw cashew mayo to the tofu based oil free ones. Thanks for sharing such a terrific suggestion, Darlene. I bet it tastes delicious! And I don’t know about you, but once I started making this mayo, I have not bought another jar of storebought. I finally found your site again and made this. Awesome! And easy! I don’t have easy access to a store for tofu plus I’ve never used it. I can stock up on cashews though. I didn’t think I would ever have macaroni salad again. This is a game changer! I’m so glad you found us again, Sarah – welcome back! While I am thinking of it, I want to invite you to sign up for the newsletter we just started sharing this year. Each Sunday we send our weekly newsletter that lets everybody know what recipes we’ve posted and what we are working on for the days ahead. I’d love you to join us. And I couldn’t agree with your kind words about this mayo more. This mayo recipe is a definite game changer. Thank you again for reading and being so kind as to write a few words to share your positive thoughts. Love it, love it, love it…………..sooooooooooo delish!! Thank you for that rave review, Trudi! That’s how we feel about this simple to make little mayo – it’s SO delicious! Thank you for reading and for sharing your encouraging words. And do stop back again, soon. How long doea this keep for ? Thanks for asking since storage info is tucked away in the last step of the recipe. 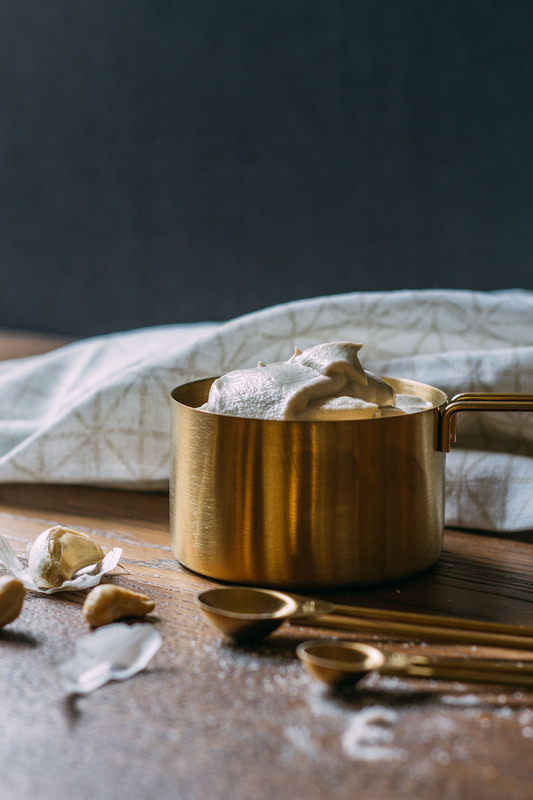 You can store your homemade Raw Oil-Free Cashew Mayonnaise in a sealed container in the fridge for up to about a week or even a little longer – it keeps well. But chances are, once you taste this stuff, your homemade jar of mayo will be empty well before a week has passed.